Given my last attempt to do the four munros I had still to do at Cairnwell had to be abandoned because of weather after Carn an Tuirc I was determined to finish them all. On parking the car and getting out to put my boots on I heard several rifle shots being fired in the Carn an Tuirc direction. So I guess I wouldn't be going in that direction then. Didn't stop several others walking that way though. There is a sign after the stone bridge to say it is safe to walk the hills provided you stick to the paths. Nervous though. As I had already walked it, decided to go over the wooden bridge and up Sron na Gaoithe. Two guys were ahead of me. I'd see them frequently over the course of the walk. There is a faint path to follow up and round the hill to the ridge behind it. I took the least steep one as had they and when I got to the ridge I walked back up to the top of Sron na Gaoithe for the view. Well worth it. I liked the look of the this hill from all directions. I had a clear view all the way to Cairn of Claise. I could still hear the rifle shots too. On the slopes of Cairn of Claise there must have been well over 50 deer in one big herd. I take it the shooter was either culling stragglers or stags. It didn't seem to bother the herd as they continued grazing as I walked up the ridge. 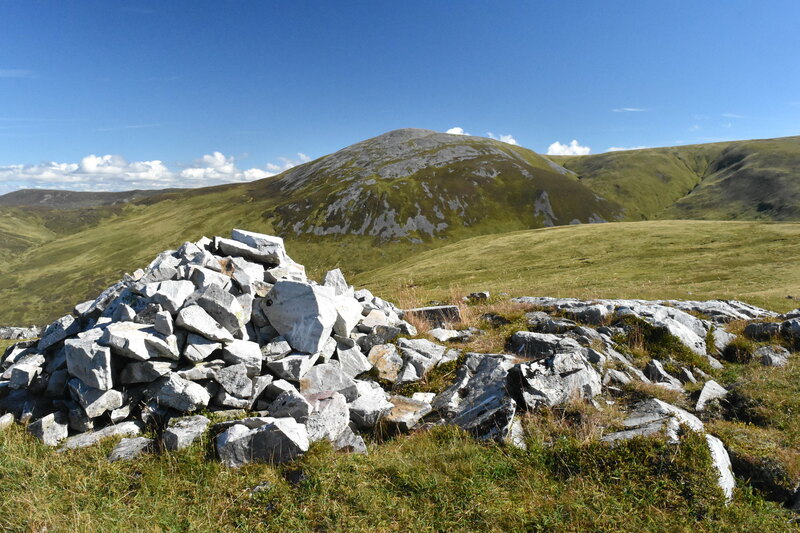 Very good walking here on a clear path with odd little white cairns along the way. 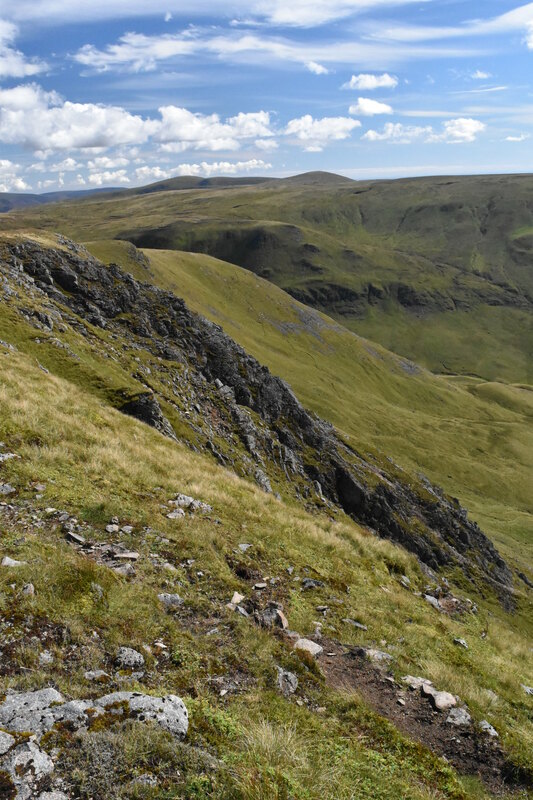 I kept to the side of the corrie nearer the top to keep the view while the two guys ahead of me looked to be heading for Glas Maol but came around on the track and we met. They were heading for Druim Mor. So off they went. 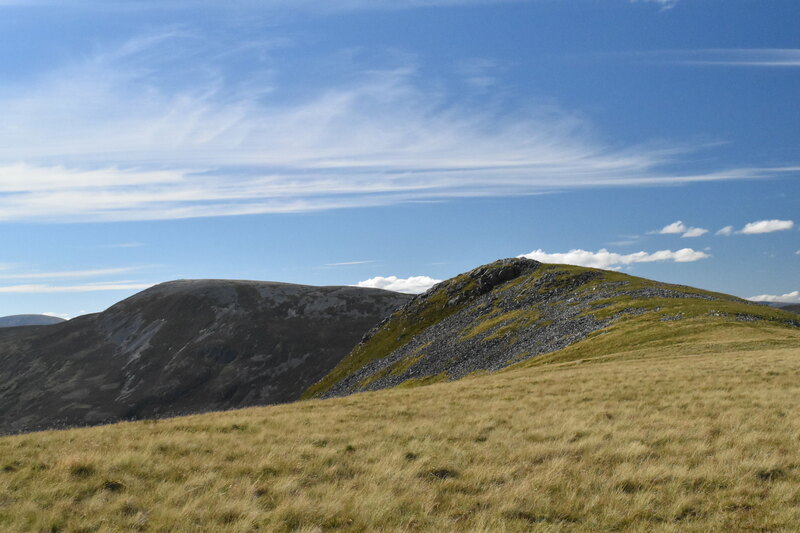 I headed for Cairn of Claise and the top. The track goes past the side of it and I simply headed over and up to the top. Great views all around now. I sat beside the cairn and had my lunch. I was curious about Druim Mor and so I headed over. The two guys were coming back. They said it was a great view down Caenlochan Glen from there as you are really high up above it. So I continued to the cairn and over to the edge. Sure enough a fantastic view from Glas Maol all the way down. This was a diversion so back to the other hills. 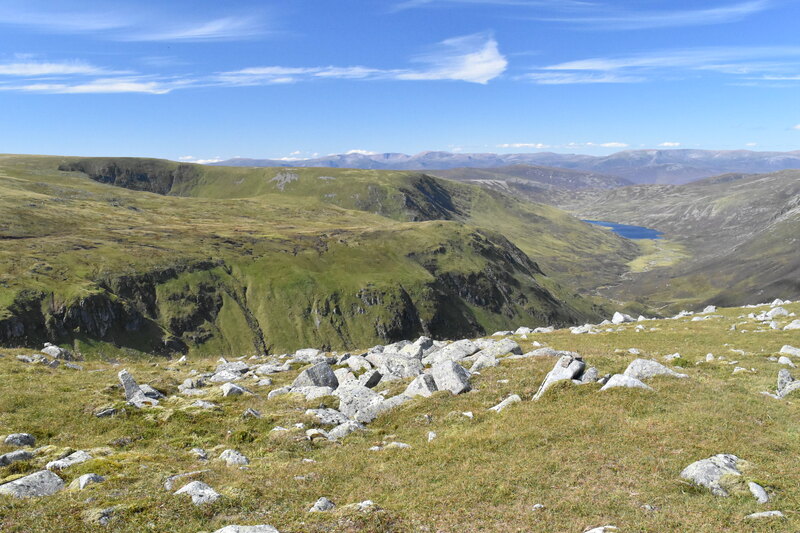 It took a bit of navigating through the boggy slopes below Cairn of Claise to pick up the path to Tom Buidhe. Cotton grass is never a good sign. But my feet were dry and it is an easy walk over to Tom. The path to Tolmount is fairly obvious and it didn't take long to get over there. 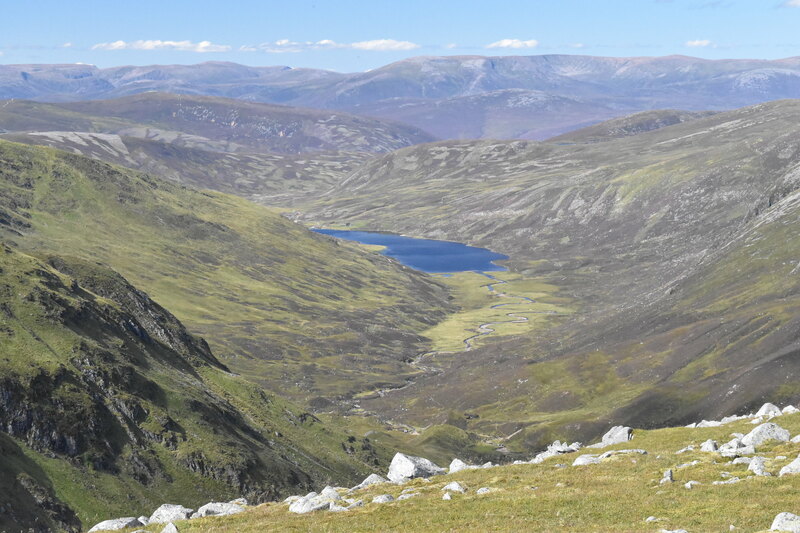 Tolmount gives better views especially along Glen Callater. I wanted to linger but my time was getting short. The walk back over to Cairn of Claise gets a bit lost at the peat bog and water between the two hills but once round it the path is easily picked up back to the top. I didn't go back up but headed straight back down the ridge to Sron na Gaoithe. I missed the top here too and walked back down to the car park. I took a slightly more direct path to save time. It was a great day and a great walk.